Home > Men's Vintage Shirts > All Men's Vintage Shirts > (XS) Vintage Mens 70s Polyester Photo Print T-Shirt! Wind Surfing Dude! 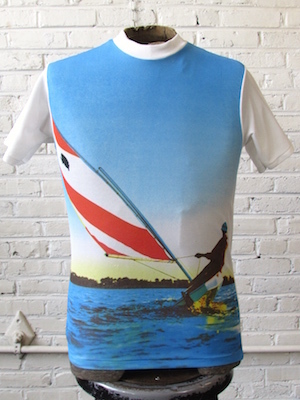 Vintage mens 1970s photo print T-shirt (may actually be a kids size, but what look super good on a smaller guy!)! 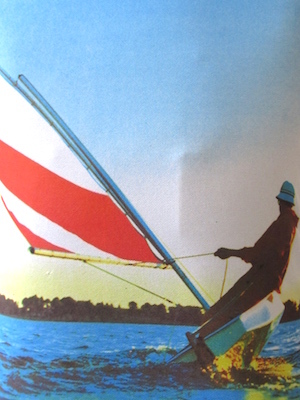 This very cool T-shirt has a white base with a photographic image of a guy wind surfing that covers the entire front portion of the shirt! Sleeves and collar are white. Tagged by Custom Casual. 100% Polyester. Chest: 34" XSMALL. The shirt is tagged a Medium, but as we mentioned in the description the shirt may be a kids size. Please check your measurements before ordering!